Two years after Energy EFT & the GOE's popular Energy EFT Master Practitioner Course was launched, our chairperson Silvia Hartmann has announced a brand-new Energy EFT book and 1-day training called "Positive EFT" which offers yet another quantum shift in our "third field". As you may know, in 2011 Silvia Hartmann rewrote classic EFT from the ground-up following Gary Craig’s retirement to make the technique simpler, easier to learn and way more effective. One of the many advancements was ditching the old SUD scale (0-10) with the new SUE scale (-10 to +10) which gave us the ability to measure positive emotions in our clients. In effect, zero on the SUD scale could be anywhere between 0 and +10 on the SUE scale depending on how energised our clients really are. 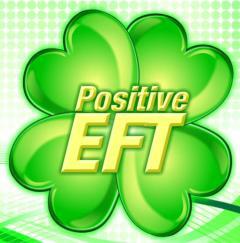 And this has been a huge step forward for EFT practitioners world-wide. Gone is the apex affect where clients forget the problem, yawning is now indicative that more tapping needs to be done – and “one minute wonders” are now fully explained akin to healing events. For two years since the course was launched, hundreds of EFT Master Practitioners and thousands of Energy EFT self-helpers world-wide have been enjoying this fine granularity and playing with increasing the flow on positive energies. Energy EFT has now moved far beyond just being an energy method to heal the past and de-stress the present. It has become a fine tool to create and sculpt the future you want, increases confidence and makes you excited about what comes next in your life. And a positive future is infinitely more important than a negative past. Because EFT has been associated with traditional therapy, it has become common practice to “dig for trauma” yet Silvia Hartmann has discovered that when we work with positive energies exclusively and in the correct way, there is no need to tap on the past at all. That means a Positive EFT Practitioner or an EFT Master Practitioner can treat traditional clients by working with positive energies, but are also able to do success coaching and life coaching by increasing the energy flow on what they want to achieve. This gives you far more opportunities you can offer people who may keep coming back to get that added energy as their new, positive life unfolds before them. The GoE will be doing a lot of promotion behind Silvia Hartmann’s Positive EFT in the next few months, which will be available as both a paperback as well as a 1-day practitioner level training course that is open to everyone regardless of prior experience. We do recommend that people attending familiarise themselves with the book “Energy EFT” to get the most out of their day. As usual, GoE trainers who attend this course as a practitioner will then be qualified to teach it to others, as well as certify them for membership of the Association. Practitioners who are certified in Positive EFT will also be able to teach it to others, but won’t be able to offer certification. Because this course only deals with positive energies, it is much safer to teach and practice, especially for introducing people to EFT. At your discretion, you may choose to call non-certified trainings you put on whatever you think the audience would like, such as “Introduction to EFT”, “Tapping into Success”, “Team Building with EFT”, etc etc. You may use the cost-effective workshop manuals for evening classes, 1 day events, public demos – and for going into businesses, hospitals and schools. The course manual is broken down into four sessions: “Welcome to Positive EFT”, “From Stress to Success”, “From Problems to Solutions” & “Positive EFT for Two or More”. Anyone doing the full-day training will have a much clearer outlook on what they want to achieve, and how to go about making it a reality. Once introduced to EFT, people who wish to professionally help others should go on do the Energy EFT Master Practitioner course when they are ready, which remains the ultimate EFT qualification. Silvia Hartmann will be teaching Positive EFT on both sides of the Atlantic in 2013, so if you’d like to learn from the originator herself please do attend one of her trainings. The first event has been announced as being on Sunday 9th June 2013 at the London Gatwick Europa, with other dates TBA. AMT trainers who qualify with Silvia next Sunday will also be able to certify you in this qualification once they’ve announced their own events.